Wednesday May 1, 2019 from 4-6 P.M.
No registration required, open to the public. Join our surgical experts to learn about this common but poorly understood condition, the importance of early detection and the latest minimally invasive procedures for hernia repair. Swelling, a bulge or pain in the abdomen, pelvis or groin area? Pain or discomfort, especially when bending over, coughing or lifting? Weakness, pressure or a feeling of heaviness in your abdomen? 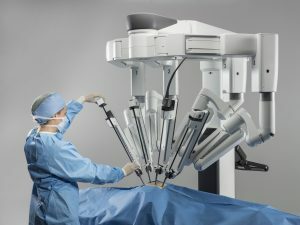 Ever wonder if robotic surgery is right for you? See for yourself our robotic-assisted surgical technology in action! You can even take it for a “test drive”. Free, private hernia screenings will be available following the presentation. Click here to download the FREE Hernia Screening flyer.